This is going to be the final Cogito for a few weeks. Most of the main science venues are taking a summer break, so this column will too. Before we go, though, one final week’s worth of sci-tech events. The Dana Centre has two gigs to round off July. 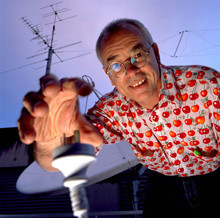 Dr Karl’s Dis-information features ‘Australia's most popular geek comic’ – Karl Kruszelnicki. (That’s him in the photo; he really is quite the geek.) Dr Karl will be debunking scientific myths, and all that jazz. Unfortunately, this one’s sold out, but you can watch a live webcast from the comfort of your own laptop. Then more wacky weirdness at the Dana courtesy of the Punk Science team on Thursday. And that leaves just one more event this week. The Natural History Museum have a daytime talk by a conservation expert, who’ll reveal how fossils are extracted and preserved. See you again in the autumn, and thanks for reading.